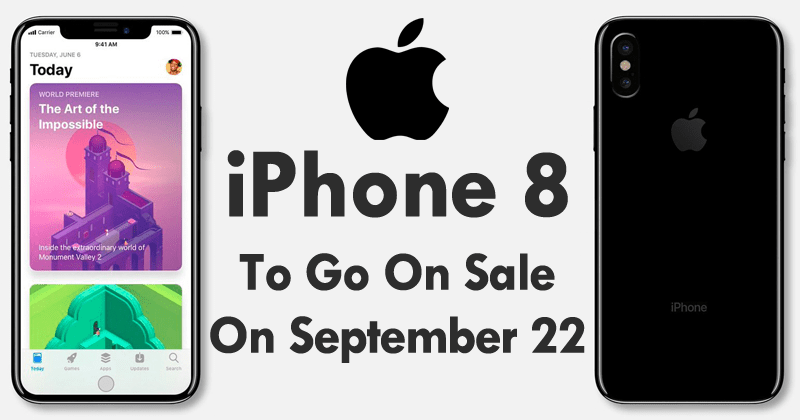 We all know very well that the tech giant Apple has very little time left simply to show the world their new iPhone, of course, iPhone 8 along with iPhone 7s and iPhone 7s Plus. But, now it seems that the selling date of iPhone 8 got finalized. There is very little time left for the tech giant Apple to show the world their new iPhone! The expectation is very high even because the South Korean giant Samsung set the bar high with the release of Galaxy Note 8. After knowing that the new iPhone will be presented on September 12 and that the base amount will be (apparently) $999, now there is new information that indicates that the new Apple iPhone will begin to be sold on September 22nd, 2017. The “leaker” Benjamin Geskin returned to publish information on his Twitter regarding the next iPhone. This time, Geskin made it known that the new iPhone will begin to be sold on September 22nd. To sustain such information, Geskin revealed that British operator O2 was notified that iPhone 8 sales would only begin on that date. As we have already mentioned, the iPhone 8 should come with a 5.8-inch OLED screen (with 5.15″ usable area) and 3D facial recognition. Also expected is an iPhone 7s and iPhone 7s Plus, which should have LCDs of 4.7 and 5.5 inches, respectively, and should include some features present on the iPhone 8, such as wireless charging. The iPhone 8 should initially be available only in limited volumes, as production seems to have been a challenge for the technology giant. As for Apple’s TouchID fingerprint sensor, the mystery remains. It is known, however, that the Cupertino giant Apple has patented an on-screen fingerprint recognition technology based on acoustic images. Like the date of Keynote, which will be on September 12, the sales start date of the one that promises to be today’s best smartphone is now confirmed.